The JAC X200 is produced in Pakistan. Consult 25 years of Pakistan Historical Data here. The Pakistani new car market gains 6.3% year-on-year in 2018 to cross the quarter-million annual sales mark for the first time in history at 254.958 units, signing a second consecutive record year. Note this data is for locally-made vehicles only, as published by the Pakistan Automotive Manufacturers Association, however this is still a pretty accurate representation of the most popular new cars in the country as imports of new cars remain limited due to very high duties. Used imports are on the rise though and actually hamper the new car market. Suzuki (+5.8%) remains by far the most dominant force in Pakistan with a whopping 54.1% share, yet this is slightly lower than in 2017. Toyota (+6.5%) matches the market to remain at 25.7% while Honda (+8.7%) improves to a round 20%. 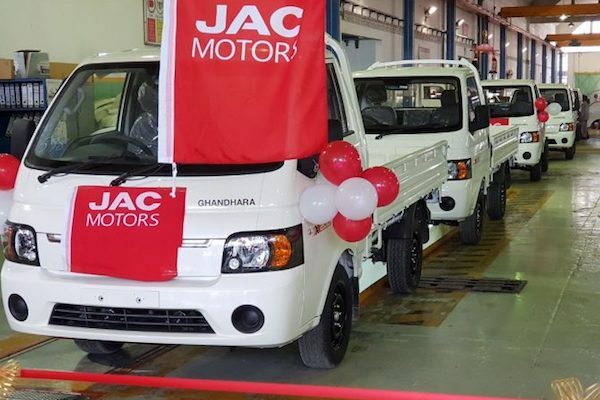 A very rare occurrence, this year we welcome a new brand in the Pakistani-made charts and the very first Chinese carmaker to officially report on sales of locally-made vehicles: JAC with the X200 pickup, manufactured through a joint venture between JAC and local manufacturer Ghandhara Nissan Ltd (GNL). Note two other Chinese carmakers currently produce locally but have not reported sales so far: FAW (with the V2 hatch) since August 2017 and Dongfeng since April 2018. Granted, JAC’s footprint remains negligible with less than 400 sales and 0.1% share over the Full Year. Model-wise, the Toyota Corolla (+3.5%) celebrates 10 consecutive years atop the Pakistani charts at an imposing 21.2% share, even widening the gap with its direct follower the Suzuki Mehran (-5%) to over 13.000 sales. The Suzuki WagonR (+28.5%) signs the biggest gain in the Top 10 but remains at #3, distancing the Honda Civic (+11.4%) and Suzuki Cultus (+12%). The Toyota Fortuner (+35.4%), Suzuki Swift (+24.1%), Toyota Hilux (+18.9%) and Honda City (+13.5%) also impress. Full Year 2018 Top 4 Pakistani-made brands and Top 13 models vs. Full Year 2017 figures below. Full December 2018 Top 4 Pakistani-made brands and Top 13 models below.